* Christmas IDEA! Just a few days away. Yup, it's almost Christmas! I've got the tree up, and half the outdoor decorations done. We're expecting SNOW! It will be the first white Christmas in a long time. Makes me feel 40 years younger! Gotta get the sleds ready, but in the meantime, we've got lots to talk about, so lets get started! A while back, I talked about expanding the drawing section of the site, but my web guru said I needed to stay focused on "Oil Painting Techniques". I still plan on sneaking the section in sometime in the very near future (shhhhh, don't let him know!) but for now, we take his advice and expand yet again, into areas that aren't found elsewhere on the site but are very very relevant to oil painting! So far, I've covered a little on flower painting, and some on still life painting, but have left out portraiture and landscape. Not any longer! Sometimes my head wants to blow up with all the ideas that float around in there, so I gotta let a few of them out, and in the meantime, you get the benefit! Boy oh Boy, did I open up a whole new sand box to play in! I've got a few articles here that talk about our most popular genre in modern times. Heck, it might be the most popular since pre-historic times, even "Cave-men" painted their outside surroundings within the walls of there habitats! We will talk about the different approaches and techniques used in creating landscape oil paintings, our little bit of outdoors brought inside! Landscape Painting, our most popular genre! The site has grown to over 250 pages and continues to spread it's wings! I've had to do some major housekeeping to help folks get around easier. What you'll find in each major section is a Navigation Box. (see below) Within it are active links to all the pages that relate to that particular section of the site. So when browsing, your experience is streamlined, and you can go back and forth without really losing your place. 1.Materials needed to paint. 6.Toning the canvas. 2.Stretching the canvas part 1. 7.The Umber Underlayer Painting. 3.Stretching the canvas part 2. 8.The Gray Under Painting. 4.Preparing the Canvas. 9.The Color Layers. 5.Transfering your drawing. 10.The Finishing Layer. 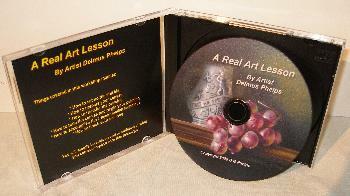 This box is found within the main lessons section and describes the Flemish Method of painting! It's what the site was originally based around. So much has been added since these first few pages, I really get pumped up to think about where we're headed! Your help and advice needed! Would you like to help grow this site! There are 2 ways that you can. 1. Have you a twitter, facebook or other social media account? Why not mention this site to your friends. Especially your art friends as this information is for the artist in mind and those that have always wanted to be. Have you got your own blog or website? if we have related themes, (art related) lets exchange links! 2. Secondly, are you an expert in an oil painting technique? Lets say you can do a great ocean wave, or a beautiful bird? 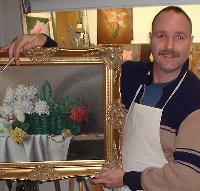 Include it here at your oil painting tips! You can upload up to 5 photo's of your process and help others learn the tricks of the trade! Help us help others! Many already have, and I'll be categorizing the sections soon. Come and join our discussions. For those that have wondered what to get their friends for Christmas, I've got an idea that will last them a lifetime with the joys of painting! My e-book on the Flemish technique is now available on CD and packaged really nice. I ship most anywhere, and this is gonna make a great stocking stuffer for your friends or family members. Along with a basket of paints, brushes and the CD, your gonna see some eyes begin to sparkle! Let me know what you think! Have I helped you in any way? Twitter me, or drop me an email. I would love to see some of your work!